This is a follow-up post to my previous project page Part 5 (PC software). This is the last post concerning this project. I have done some tests with the final hardware and software. Furthermore I have written a small conclusion to this project. 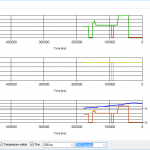 An interesting test is the transient response on a sudden change of the setpoint current. In this case I stepped the setpoint current from 2 A to 0 A. The following picture shows the voltage across the shunt. 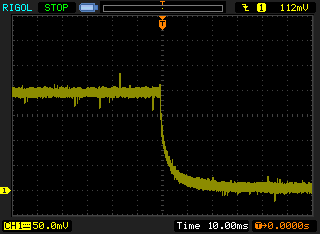 You can see a voltage drop of 200 mV (corresponding to 2 A) within a time span of around 20 ms. The time could be reduced by decreasing C18 and C21 in the schematic. The latter one should be adjusted carefully because a too small capacitor may destabilise the control loop. Step response from 2 A down to 0, measured across 0.1 Ohm shunt. This is a follow-up post to my previous project page Part 4 (Firmware). 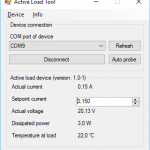 One way to interface with the active load device is to use a terminal program and query the state of the device or send commands to it manually. But this is of course very cumbersome and not very user-friendly. That’s why I have written a program called Active Load Tool in C# for Windows. The setpoint current can be changed and all relevant pieces of information can be monitored. 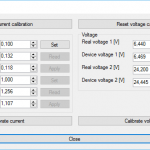 Furthermore the tool allows to calibrate the device and plot oscilloscope-like graphs visualising current, voltage, power and temperature. Actually I have separated the program into two different projects: ActiveLoadProtocol and ActiveLoadTool. The former one is a class library which capsulates the interface between application and device, while the latter one depends on this library to present a GUI to the user. The class library can easily be used in own projects, for example to automate and log test runs. You can find the source code of the software (project written with Visual Studio 2015) in my GitHub repository. This is a follow-up post to my previous project page Part 3 (Schematic, layout and pictures). At this point the hardware development is finished and fortunately nothing blew up as I had plugged in a voltage source for the first time. 😉 But of course there is no functionality yet. The load sinks (nearly) no current which is a good sign because all port pins of the microcontroller are in a high impedance state while there is no firmware on it. That means the setpoint current and also the actual current of the current control loop are (nearly) zero (the opamp input “sees” ground). This is considered a safe state as nothing bad can happen in this case: no functionality – but also no potential to destroy something.